Thanks for asking! I started another project, but didn't came far. Now I'm employed fulltime and got a daughter of four months. Still hoping to get back to game development some day. If all turns out fine, it might already be end of this year. @Schrompf: Cool. Then I'm looking forward for information about this project I also have small kids (two daughters: 4y and 2y) but I stayed full-time indiedev (with my brother) and I must say financially it's very bad solution (fortunately family help us) :/ (and work on the Archaica takes much more time that we planned). 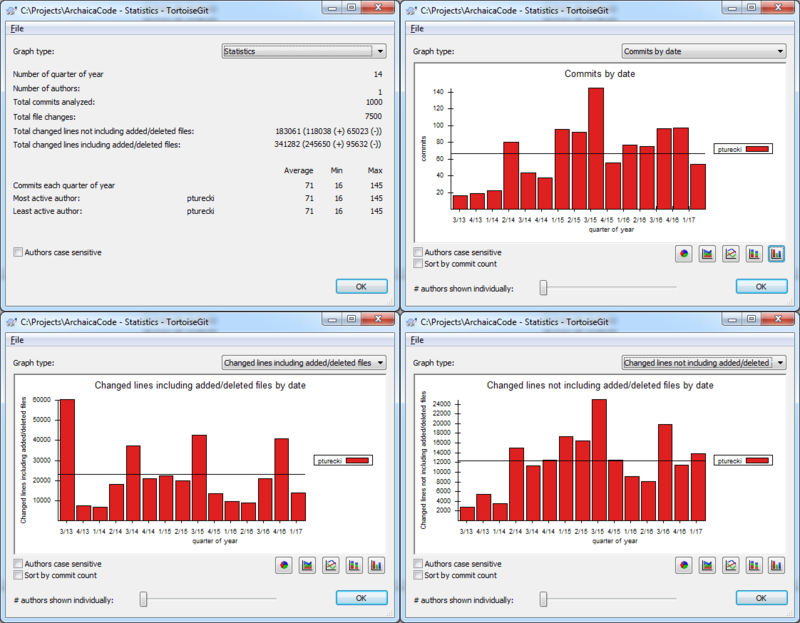 I'm wondering how look similar stats in other projects that uses custom engines? Maybe your coding is so much more concise than mine :-) Splatter had 250k line in custom code and ~2.5 million LoC dependencies. Most of that was Boost, though, so that doesn't count for much. The port to Linux and Mac added surprisingly few lines. @Schrompf: I think Your engine has more features (for examples complex animations and particles, both with nice tools - and both things are missing in Archaica engine). 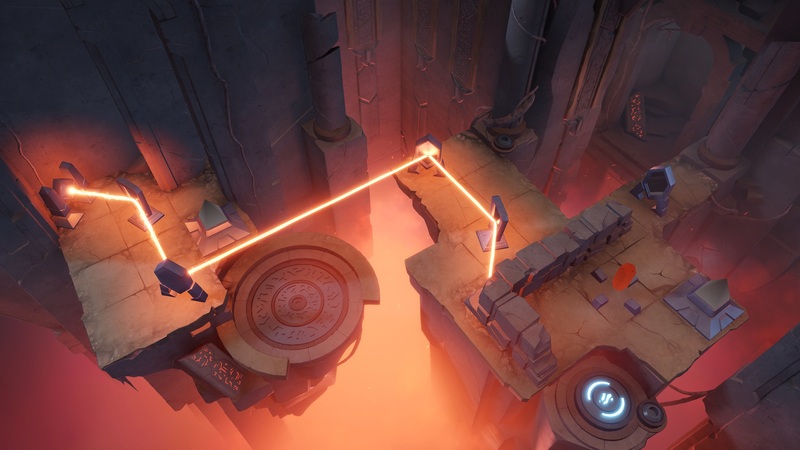 Also Archaica is for PC only (no code for other platforms). Also my code is rather simple (I like simple code - maybe even too much): no setters/getters, almost everything is public - I try to hide implementation inside cpp files (instead of private parts of classes), minimalistic class hierarchy (but without exaggeration - there is really a lot of classes in the code), rather small number of interfaces, no dedicated thread for renderer etc, also game-code and engine-code has built-in a lot of editor functionality (so editor has comparatively small number of lines). Full source code at the moment has: 65k (code) + 22k (blank) + 8k (comments) = ~95k lines. This reminds me of God of Light for iOS. I loved and finished that game, but this one seems a lot more gorgeous and will probably feature much harder puzzles, considering it's for pc. So beautiful! Reminds me of the witness which I love. @jctwood: Thanks! But remember that this is a very different gameplay: Archaica has not first person camera, only top-view and rather static. And a short description. 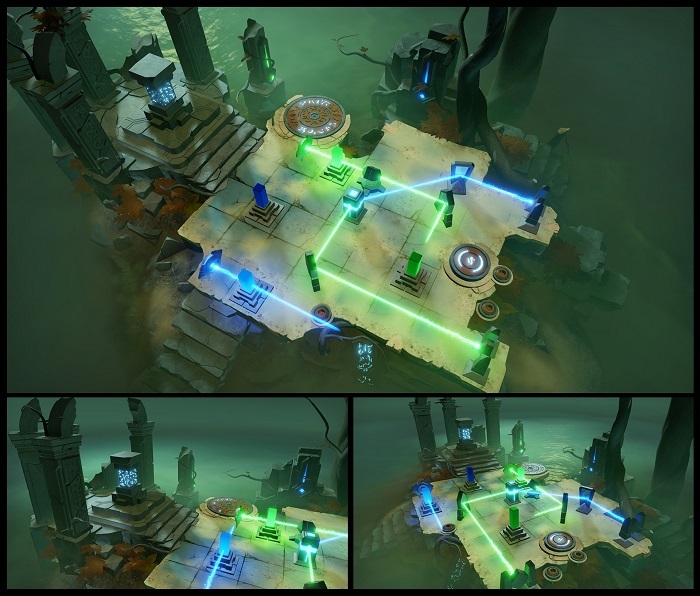 This is fourth realm in Archaica - The Crystal Mines (this realm is not finished yet). All levels in this realm (except first) are deep under ground. The deeper the level is the more red color (from lava) it has. Holy crap is this pretty. You guys really nailed it in the trailer. I might have thought a game about rotating mirrors would be a tough sell. But the trailer made it all feel super epic. Really came across as a beautiful puzzle-world filled with mysteries. Hi. 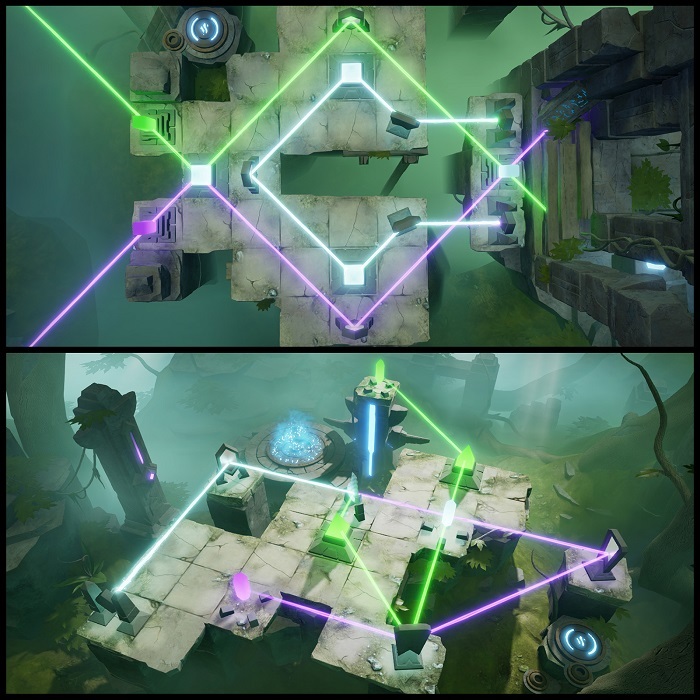 Level design work on a next realm (jungle) is almost done, and on this occasion I have a question: Are symmetrical solutions in puzzle games good or bad idea? What do You think? 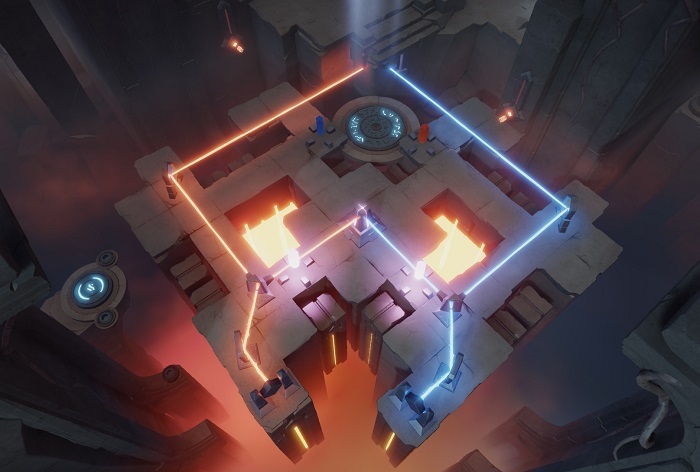 Are symmetrical solutions in puzzle games good or bad idea? What do You think? I love good looking solutions to puzzles -- be they symmetrical, or just visually pleasing in some other way. The Witness has some fantastic symmetrical puzzle solutions. Even though they're simple, I love their style! Of course, it's all subjective. But I like your top solution (the symmetrical one) more than the bottom solution. It's a nice, small reward for success. @TheWanderingBen: I also like good looking solutions (but my brother pay more attention to this aspect). And I prefer top solution too Indeed it can be treated as a small reward for success. Thanks for the reply! I definitely like symmetrical. Of course the symmetry may make the puzzles easier? @AaronB: I think there are definitely easier. But for that reason You can make a more complicated puzzle than in similar assymetrical version of the particular puzzle. Hi. Some light-weight post today, not 100% game related (but the effect is for use in game of course). No shaders are used, only C++ code. Deformation is made by supplying special per-char callback to text rendering function. And some details (note that we use custom engine). Text rendering function updates (every rendered char) DrawTextCurrentCharInfo data, prepares DrawTextCbParams and passes both to the callback (callback modifies only DrawTextCbParams). Below is the simplest callback code for second effect (from top). The rest are similar (small differences in code). If anyone is interested then I paste them too. All this effects are doable using vertex shaders (but it was simpler for me to add this deformation functionality in C++).